No this isn't those ugly "Back to the future sneakers" this is Nike's newest innovation and apparently you can get them later this year.
" 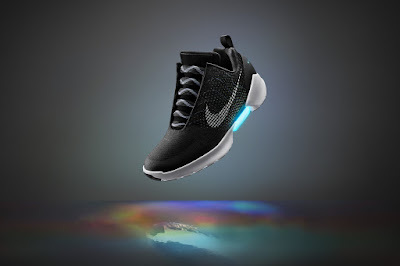 Welcome the Nike HyperAdapt 1.0, the first performance vehicle for Nike’s latest platform breakthrough, adaptive lacing. The shoe translates deep research in digital, electrical and mechanical engineering into a product designed for movement. It challenges traditional understanding of fit, proposing an ultimate solution to individual idiosyncrasies in lacing and tension preference. I'm normally a high-top Jordan guy but really want these... I always found the original self-tying Nike's from the movie "Back to the future" ugly. They were even uglier when I seen them in person at last year's NY Comic Con. But these.... these Nike got right. Can wait till I can get my hands on them.